In Counter-Strike, players can earn, trade, and sell cosmetic flourishes for their weapons. Over time, this has given rise to a thriving unofficial gambling scene. Players bet skins with real world value on CSGO eSports matches. For some, it’s a means of making an awful lot of money. It can also be awfully sketchy, which is why one man is suing Valve. 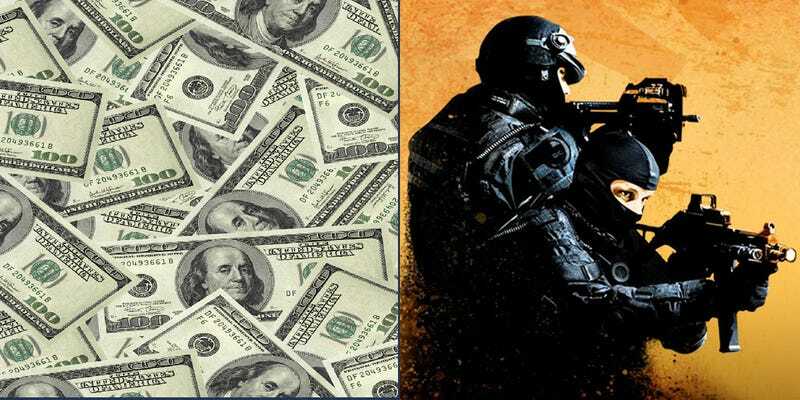 Given Valve’s notoriously hands-off approach to, well, everything, you probably won’t be shocked to hear that CSGO gambling is entirely unregulated. Third-party sites like CSGO Lounge facilitate transactions through a combination of their own interfaces and Steam sign-ins, and Valve doesn’t really seem to mind. These sites often tend to have lax age requirements as well, allowing teens to participate in what essentially amounts to real-money gambling. Bloomberg did an expose on all of it earlier this year, in which they cited an estimate that CSGO’s gambling scene comprised millions of people and $2.3 billion in 2015. Further, based on the Bloomberg report, McLeod’s suit claims that many CSGO gamblers are minors. “Unlike traditional sports, the people gambling on eSports are mostly teenagers,” the suit says, adding that “also unlike traditional sports, the company that makes the product being wagered on is directly profiting from that wagering” due to the fact that Valve takes a percentage of the money from every skin sold. The suit further alleges that McLeod himself gambled in CSGO and lost money as both an adult and a minor. As of now, Valve has yet to respond to the suit.